Judge Dredd is one of the baddest mothers of all time. The guy slept for years and woke up and went right back to work. He took some serious battle damage at the end of the last issue and we thought he was done for, but nope. 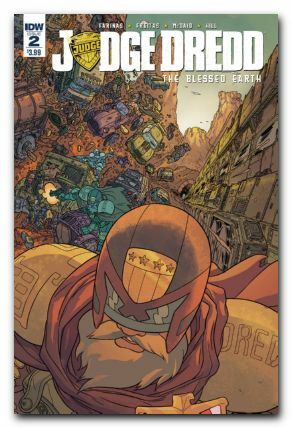 Knowing all this, how do we continue to get excellent Dredd stories? They find a way to make him tougher. They write a way to bring the story down to earth and make the innocent suffer. Our story allows two of the other Judges to stand out and become more prominent in the Blessed Earth. The detailed artwork has us wanting more of the judges and the law they lay down. The story continues to be true to anything the judges have done to this point. The plot has put more of a time frame upon our story. The next issue should hopefully build the tension.